This weekend we decided we needed to clean up the work area and find a place to store the interior plastics. 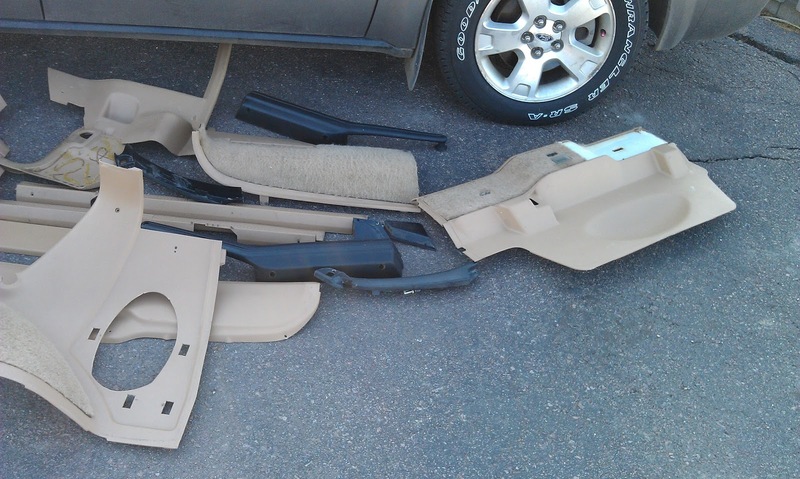 Sara cleaned all the trim pieces while I removed and vacuumed some of the loose debris from the inside of the car. (This post's title lends a nod to the 90's music we listened to while cleaning.) 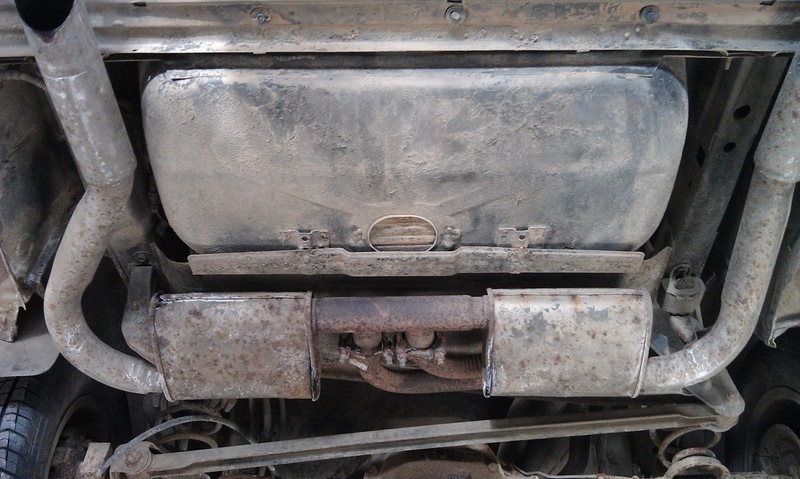 I also removed both the door panels. As you can see from the pictures they need to be replaced. I have found sources for both new panels and the upper black window trim. Now that all the pieces are dry they are being stored above the garage door. We covered the car seats in plastic to keep them clean until I take them to be reupholstered. We also took the time to dry the floor and sweep out the garage before rolling the car back in. 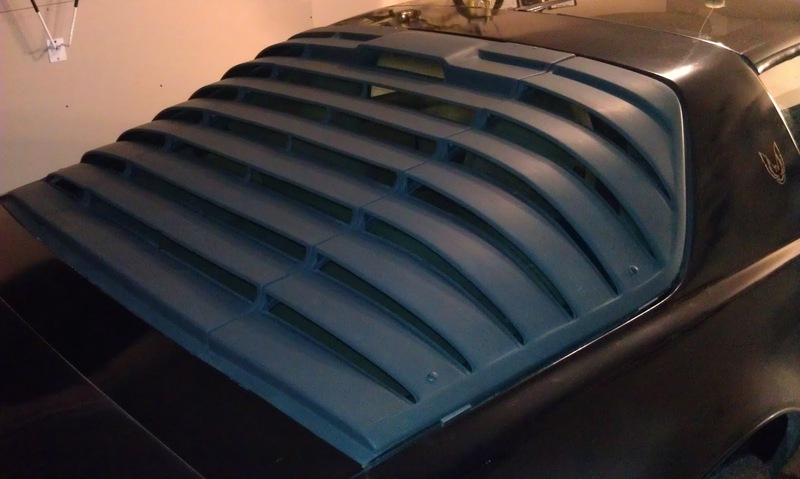 This weekend Sara and I removed the headliner in order to find out the extent of the damage caused by the leaking T-top. 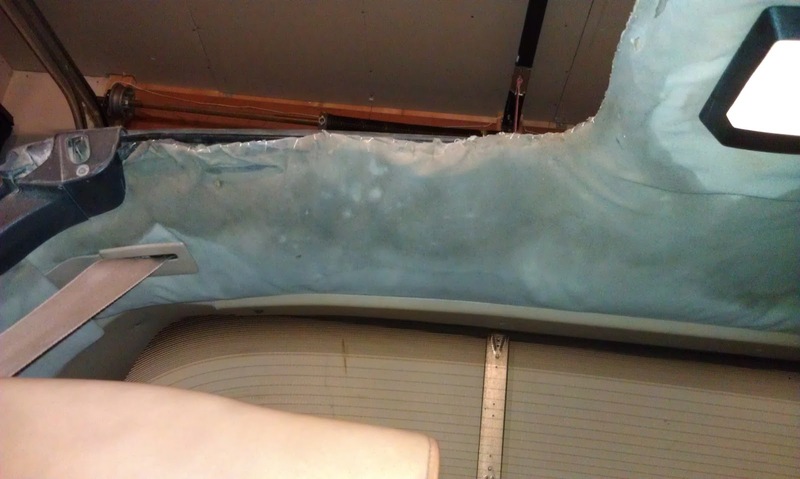 Even though the headliner itself was totally water damaged and deteriorating we were pleasantly surprised to find the roof's interior virtually rust-free. My theory is the headliner caught the leaking water and kept it away from the metal inside because it no longer fit properly and was drooping. The outside was not so lucky and the passenger side front rail has some pretty extensive rusting between the seals and the front lip of the car. So far in the areas I have checked the rust does not appear to have spread under the seals or to the irreplaceable U-channel. I have been doing some research into replacing the T-top seals. From what I have read there is supposed to be an adheasive under the seals to keep them in place and to keep water from getting trapped underneath the seals. The seals currently on the car do not have any adhesive as I was able to easily separate them from the metal. 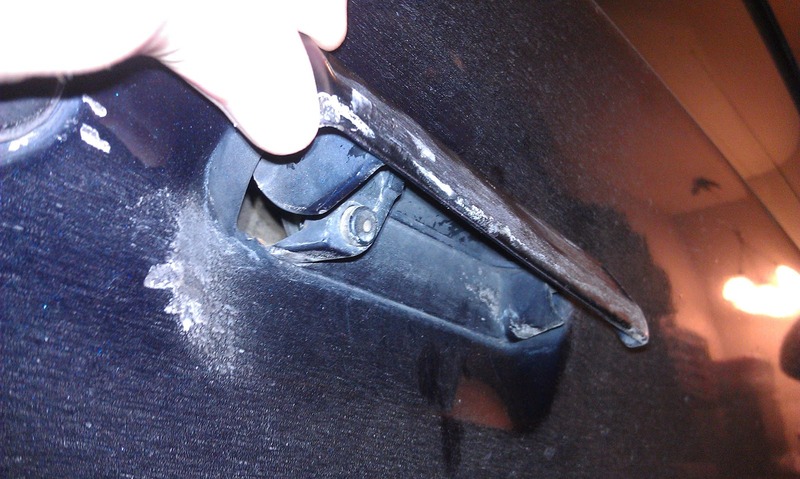 It appears that without the adhesive water was trapped between the seals and the body of the car (as you can see in the picture where I am pulling back the seal). From what I have inspected so far this seems to have only affected the passenger side. Here are some before and after pictures followed by some shots of the problem areas. It is always nice to have a mechanic you can trust. It is even better when they are willing to let you use their garage, hoist and tools. I first met Troy a few years ago when I sold the shop he works for a digital message center. I have taken our Freestyle to him ever since. The fact that Troy also happens to own an 1983 Camaro just makes it even better! I knew the car was in desperate need of a tune-up and I really wanted a mechanic's professional opinion of the mechanical shape it was in. I intend to do the majority of the work on the car myself, but there are somethings that are just easier to do when you have a hoist and can get the car up in the air to get a better look at it. I snapped some shots of the under body while it was up in the air. These are more for my reference than for aesthetic value. 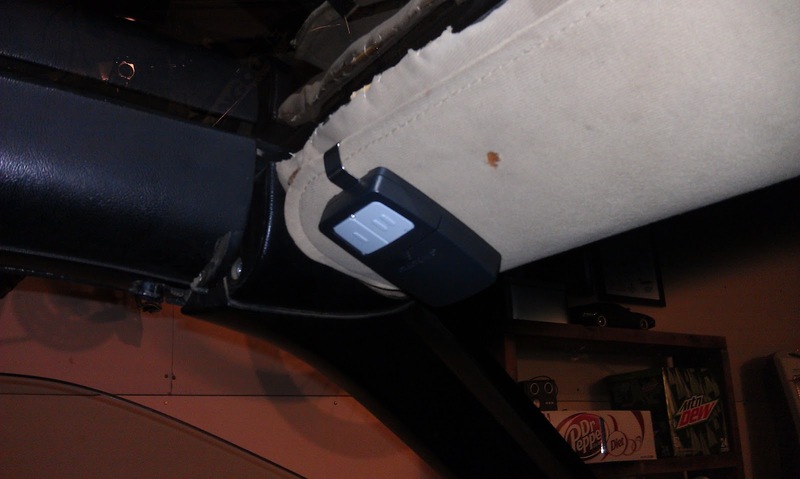 The previous owner performed a real hack job when it came to installing his aftermarket radio. I have never seen such a poor wiring job. 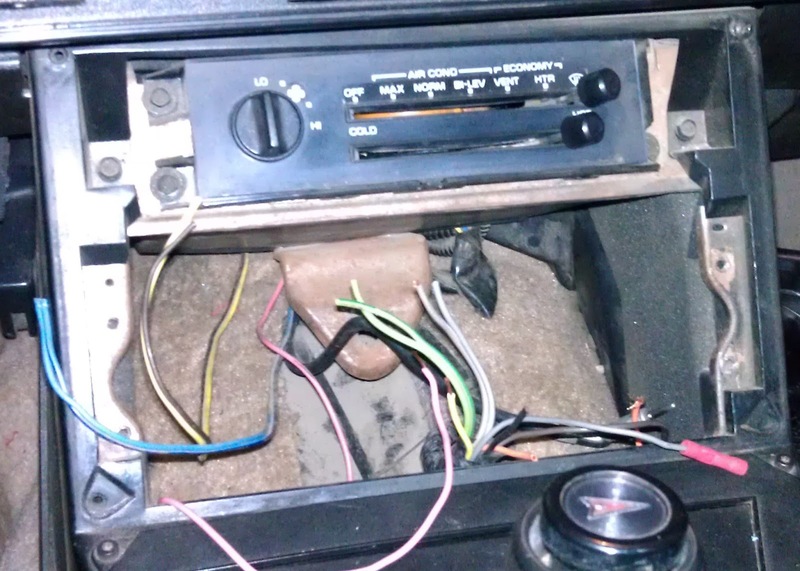 Not only did he manage to break or damage most of the console and trim pieces, but he left unused hot wires exposed behind the radio. I am just lucky these did not short out on the drive home...or did they? The mysterious headlight behavior when I first got the car back into town suddenly has a possible cause. 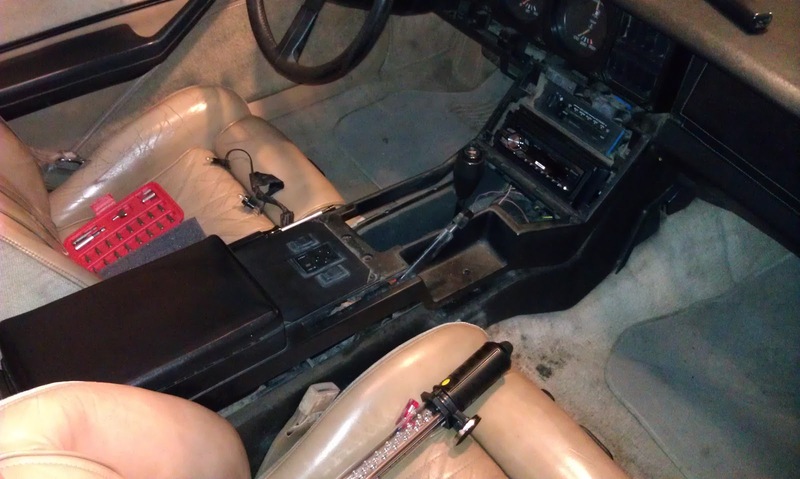 Here is a before shot of the wiring mess. With all the information you can dig up, you really have to love the Internet and Google. I was able to put together a collection of sales literature, articles and photos pertaining to the early 3rd generation Firebirds (1982-84). I have converted these to PDF for your viewing pleasure. I won't apologize for the quality of these pieces as it is amazing to me still that I was able to find them at all. This was great for starters, but I wanted to know more. Many of the cars prior 1984 had what is called a Body Tag that was stamped and affixed to the cowl of the car at the manufacturing plant. 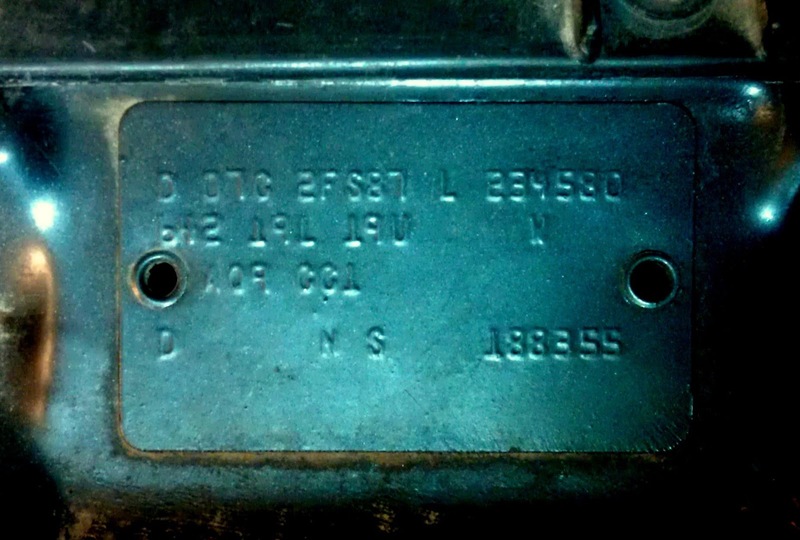 This tag contained much of the same information as the VIN, but also provided Regular Production Option (RPO) codes for body, trim and features included on the car. I snapped a picture of the Body Tag on my Trans Am and went to work researching and decoding its RPO codes. We removed the awful black sunshade! Unfortunately there is some etching on the glass I was not able to see before. I am not sure if there is a way to remove the scratches, but they are very light. I am going to research it and if I find anything I will post it. Here are the before and after pictures. 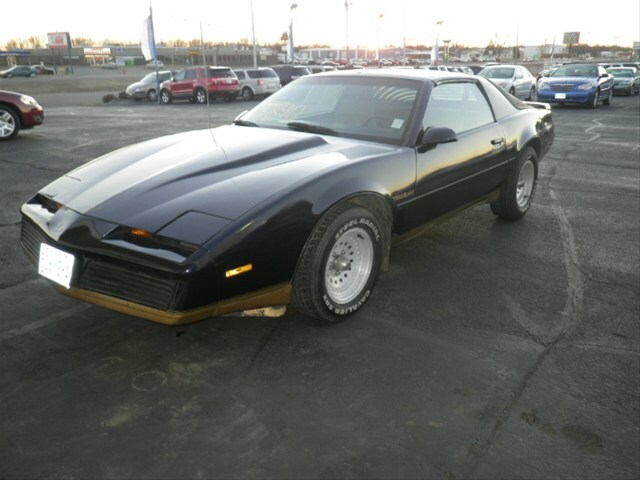 I purchased a 1983 Pontiac Trans Am from a Ford dealership in Redwood Falls, MN yesterday. The car runs good, but is in serious need of a engine and transmission tune up. It sports a 305 V8 LU5 with Cross-Fire Injection. It does have the WS6 package and 15" wheels although they are not Turbo Cast wheels. The body is in excellent condition with only minor (hail type) dents and scratches. 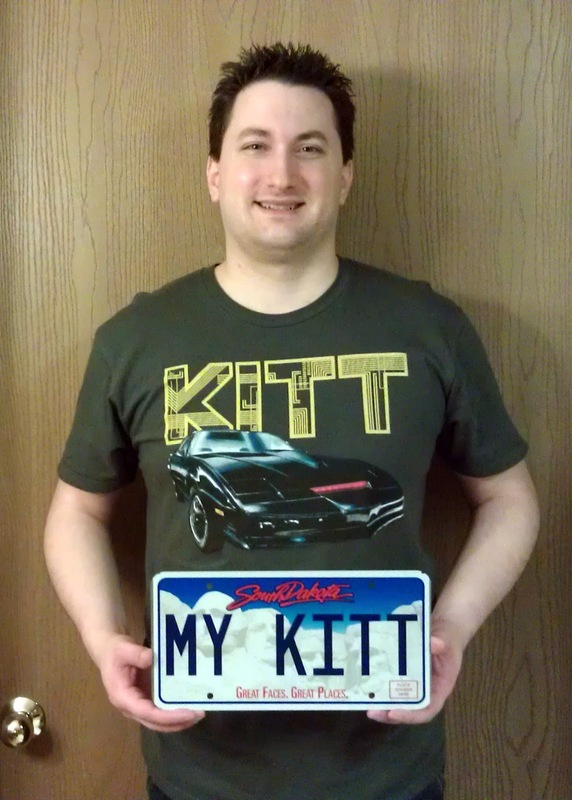 Every respectable KITT replica is going to need one, right? 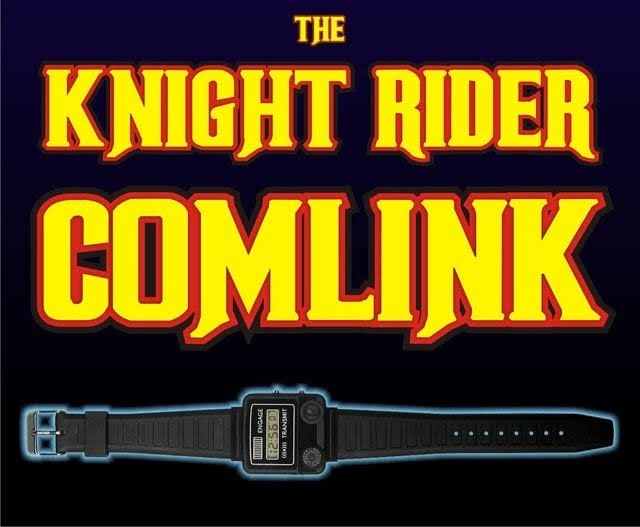 Well Mark Puette has taken it upon himself to create the most screen accurate Knight Rider Comlink the hobby has ever seen. It is nothing short of awesome, and thanks to Sara I now own one! For Christmas this year she gave me one of Mark's Comlinks with its own Knight Industries leather display stand and his 'KNIGHT' & 'Knight Industries' license plates. On Thanksgiving my wife surprised me with a Knight Rider license plate keychain! 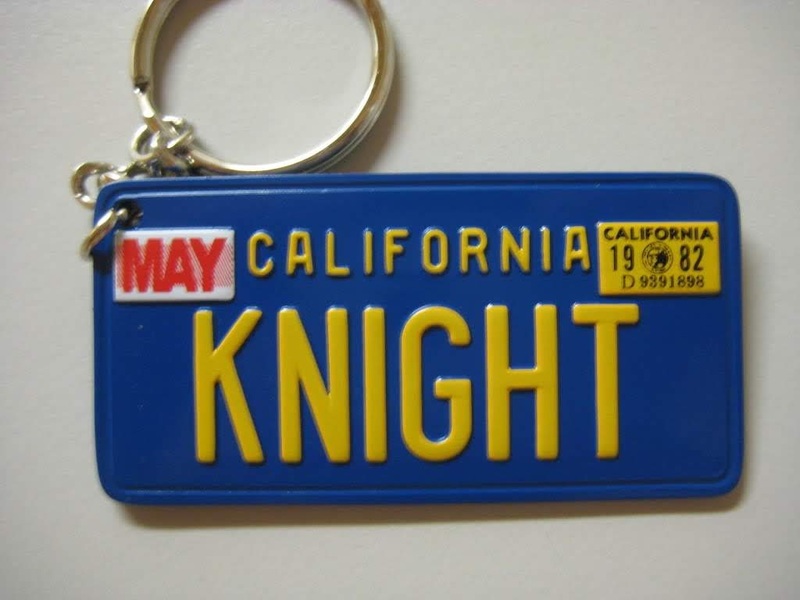 This keychain is made as an exact replica of the 1982 California "KNIGHT" licence plate. I needed a good place to start and blueprints seemed like the logical first step. Lucky for me Nick Nugent had just recently enhanced and redesigned the K.I.T.T. kit originally published in 1983 by Universal Studios. He also took the opportunity to create a matching K.A.R.R. kit. 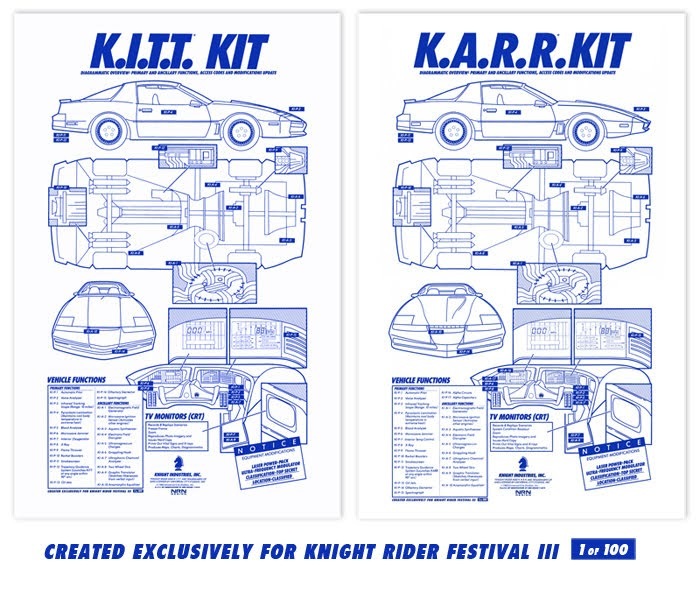 He made both kits available in limited production run of only 100 prints for the 3rd annual Knight Rider Festival held in Las Vegas. Although I did not attend, I was able to order two of these sets through the festivals online store. Thanks Nick!